PRECIA MOLEN exhibits its acclaimed flagship solutions at the Victam International Trade Fair. The weighing of raw materials in the food industry is part of a double challenge: economic and industrial. An error in weighing operations which disrupts the industrial process can be expensive. It is therefore a universal desire in the industry for weighing systems to be accurate and reliable. Present in 42 countries through 13 subsidiaries and a large network of agents, PRECIA MOLEN has been providing proven solutions to industry operators throughout the world for over 60 years. At the cattle feed and agro industrial Victam International Trade Fair held in Cologne, Germany from the 9th to 11th June, PRECIA MOLEN will exhibit the ABS-XL (a complete weighing system with a weigh hopper), alongside the I 410 ABS system (a discontinuous totalizing indicator) connected to a DATABULK ABS hopper scale management system. A true monitoring tool, the ABS-XL hopper scale offers non-constant batch weighing in static mode (more accurate than dynamic mode), providing the user with a constant continuous process. It is designed for trade use with the finest accuracy (+/- 0.1 % – 0.2 class) to weigh free-flowing bulk products such as cereals, grains or sugar. It complies with applicable directives, having been certified by the French notified bodies LNE and LCIE, which also authorizes its installation in an explosible atmosphere. A multiple-function instrument, it fits into the various stages of the process, such as product input and output weighing. More than a mere weight indicator, the discontinuous totalizing scale I 410 ABS is a true programmable terminal that can be utilised for various industrial applications. It fulfils numerous requirements, whilst remaining accessible and intuitive. 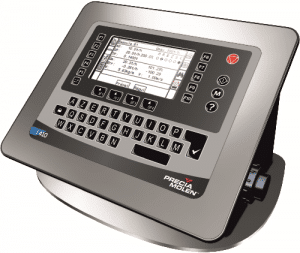 Its purpose is to allow the operation of the weighing application by managing, monitoring and commanding the connected scale. Designed to be as universal as possible, it communicates with the main current field buses (Profibus, DeviceNet, Ethernet Modbus-TCP and EtherNet/IP), and fits into any industrial process: silo weighing, batch dosing, packaging (cask filling, bagging), loading or unloading flow regulation, checkweigher, integrating belt scale, continuous weigh belt feeder, and discontinuous hopper scale. Designed and made in France, the I 410 ABS system meets the ultimate requirements of product receiving and despatching, easily adapting to the various types of handled products. 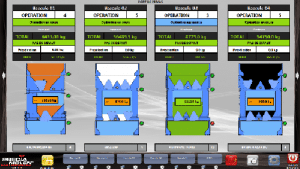 The I 410 ABS combined with the DATABULK ABS supervision software allows the remote control of up to 8 hopper scales from a supervisory unit: product selection, product set point, weight set point, operation flow, cycles of each connected scale, batch ticket, etc… All operations are saved to comply with traceability requisites. They can also be sent to the client information system via Ethernet.